These two high-yield midstream plays are in very different places, and that's not a reference to geography. As Kinder Morgan Canada Limited's (NASDAQOTH:KMLGF) name suggests, it operates in Canada. Phillips 66 Partners LP (NYSE:PSXP) is focused on the United States. However, these midstream energy companies' geographic focuses aren't the biggest difference of which to take note; they are also in vastly different places in their life cycles. Here's what you need to know to decide which is the better buy, Kinder Morgan Canada or Phillips 66 Partners. Kinder Morgan Canada is operated by U.S.-based Kinder Morgan Inc., which owns 70% of the Canadian entity. Kinder Morgan Inc. IPOed Kinder Morgan Canada in late 2017 to own a small collection of midstream assets and the Trans Mountain Pipeline project. The Trans Mountain Pipeline expansion was expected to be a multibillion-dollar growth investment that would underpin Kinder Morgan Canada's early business expansion. Things didn't work out as planned. The Trans Mountain Pipeline faced significant local pushback from both residents and governments. Kinder Morgan Canada ended up selling the project to the Canadian central government for 4.5 billion Canadian dollars. It was a good move that got the partnership out from under a troubled asset. However, Kinder Morgan Inc. wasn't happy leaving the cash north of the border and pushed through a large dividend, effectively bringing a huge chunk of the sale proceeds back into its own coffers. Without a major growth project or the cash from the asset sale, Kinder Morgan Canada's growth plans are at a standstill. It is financially strong, with net debt to adjusted EBITDA of around 1.3 times. It intends to pay a generous ongoing distribution of 0.65 Canadian dollars per share per year. And it has organic investments it can make, amounting to around CA$32 million. Beyond that, though, there's nothing in the pipeline right now. It is basically back to the drawing board -- and without a particularly clear path. The next year or so will be telling about Kinder Morgan Canada's future, as it really needs to provide investors with a more substantive game plan. Phillips 66 Partners is operated by parent Phillips 66, a large U.S. refiner. Historically, Phillips 66 Partners' growth has been helped along by asset sales from Phillips 66, often referred to as dropdowns. The last big deal came in late 2017, when Phillips 66 Partners bought $2.4 billion in midstream operations. Following that deal, Phillips 66 Partners has a large and diversified portfolio spanning the entire U.S. market. And, now that it has material scale, Phillips 66 Partners has been focused more on organic growth. It currently has around $3 billion worth of growth projects in the works (including its roughly 42% stake in the large Gray Oak pipeline project) that will take it out through 2020. 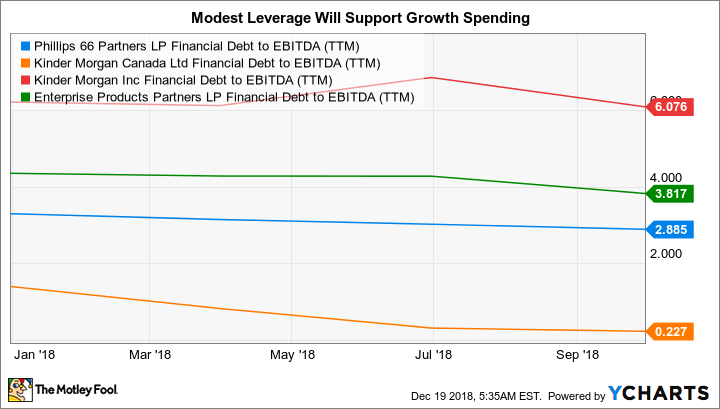 With a debt to EBITDA ratio of around 2.8 times, which is toward the low end of the midstream space, there's no reason to doubt that Phillips 66 Partners can shoulder the costs. PSXP Financial Debt to EBITDA (TTM) data by YCharts. That spending, meanwhile, should continue to support the partnership's record of increasing its distribution every quarter since its IPO in late 2013. The growth rate since that point is nothing short of incredible, averaging in at a 30% compound annual rate. That's likely to slow over time, but with robust distribution coverage of nearly 1.4 times in the third quarter of 2018, there's no particular reason to expect a material drop off right now. Recent hikes have averaged around 5% each quarter. There's nothing wrong with Kinder Morgan Canada Limited, per se. It owns a small collection of good assets and should be able to support the ongoing distributions it has promised to pay in 2019. And, eventually, it should be able to use its strong balance sheet to support expansion. However, the Trans Mountain sale was like hitting the reset button, sending the partnership back to the starting gate. Essentially, the future isn't very clear for Kinder Morgan Canada now that it doesn't have a big project on which to execute. And that's why Phillips 66 Partners is a better investment option today. It offers a well-supported yield of 6.7% and, more importantly, the partnership has outlined a clear path to growth backed by billions of dollars in spending.